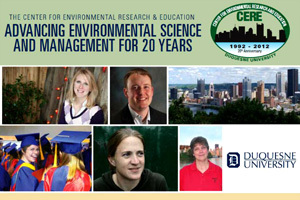 The Bayer School's Center for Environmental Research and Education (CERE) is celebrating the 20th anniversary of Duquesne's environmental science program by launching a series of speakers and other special events. To kick off the series, CERE hosted The Evolution of Environmental Science and Management: 20 Years Back, 20 Years Forward on Sept. 12. Featuring Bill O'Rourke, executive director of the Beard Institute, the event will look at the last two decades of environmental management in order to develop a prospective picture of the field 20 years from now. From the vantage point of his 30-year career in environmental protection, corporate social responsibility and sustainability at Alcoa, O'Rourke will profile the state of technology, changes in curriculum, characteristics of students and faculty, employment prospects, the perspective of business, the role of government and the central place of enlightened, responsible leadership in the year 2032. Also this fall, CERE will present Living in a New Climate Paradigm: Welcome to the "Idiocene" featuring Larry Schweiger, president and chief executive officer of the National Wildlife Federation. The event will be held Tuesday, Nov. 27, at 6 p.m. in the Pappert Lecture Hall, Bayer Learning Center. Additional events are being planned for the spring as well. For more information about the ongoing CERE anniversary celebration, visit www.duq.edu/cere20.